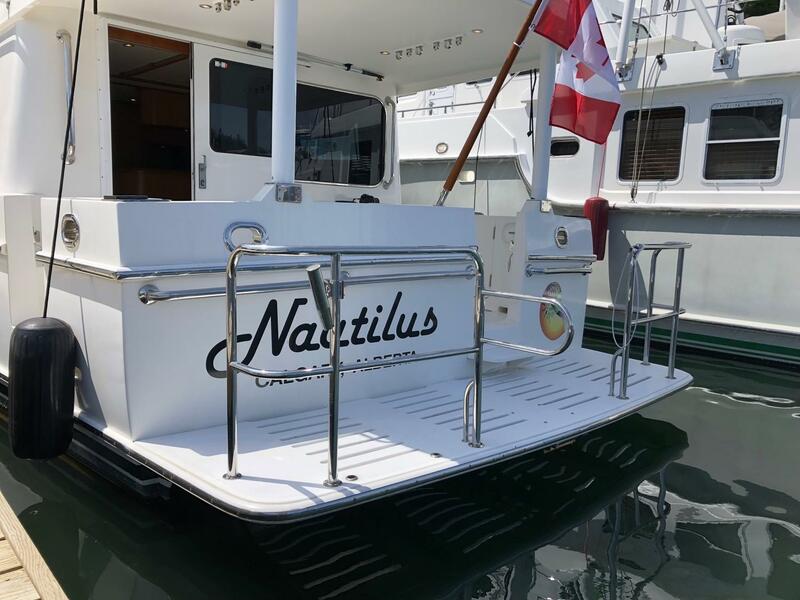 Nautilus is a long range ocean cruiser by renowned Northwest yacht designer Ed Monk Jr. and constructed by world famous Ocean Alexander. Obsessed with engineering, safety and performance. 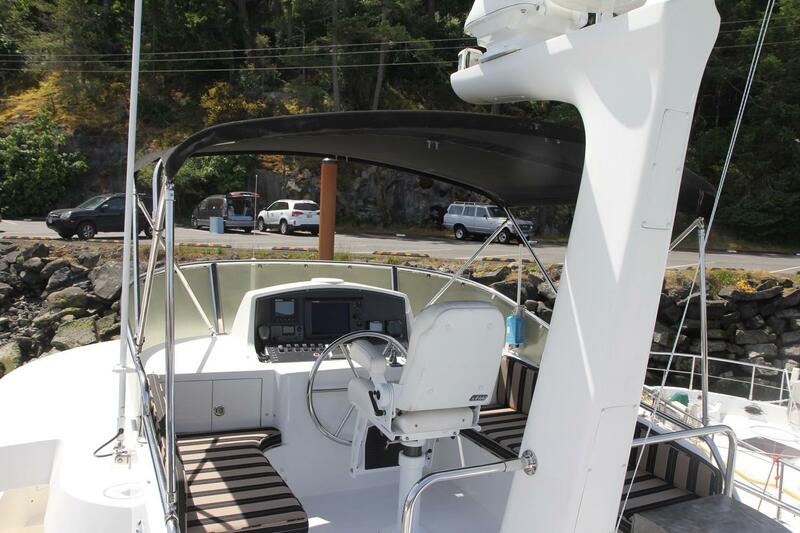 This couple's cruising yacht will comfortably take you to all your favourite destinations throughout BC, the west coast, and beyond! 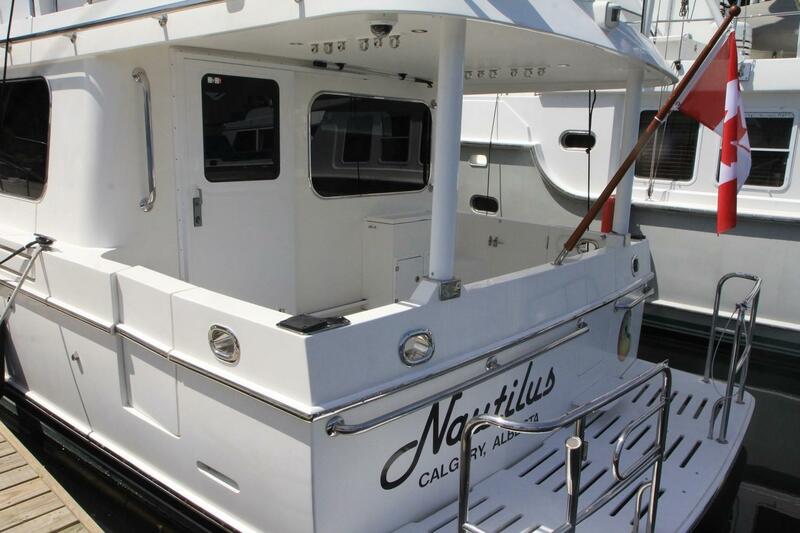 Nautilus is the last of the series, hull 14. 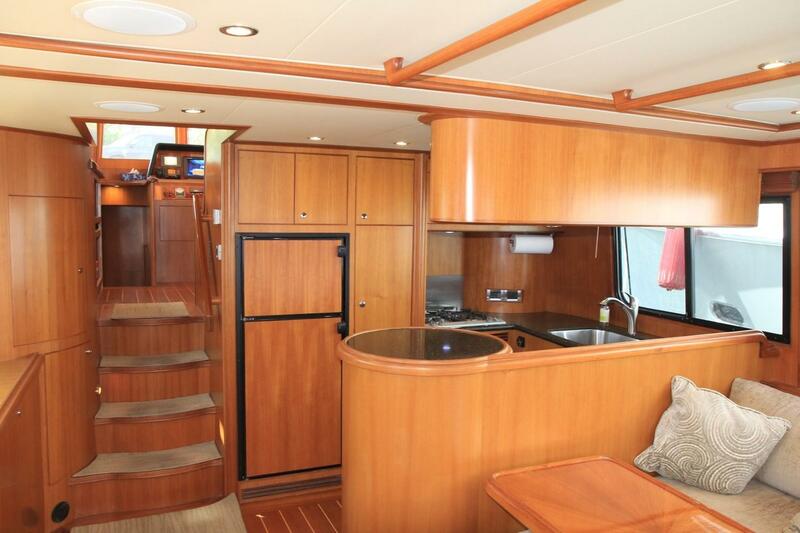 Her late model means she will always be the newest OA 50 Classico available, preserviing a higher resale value. 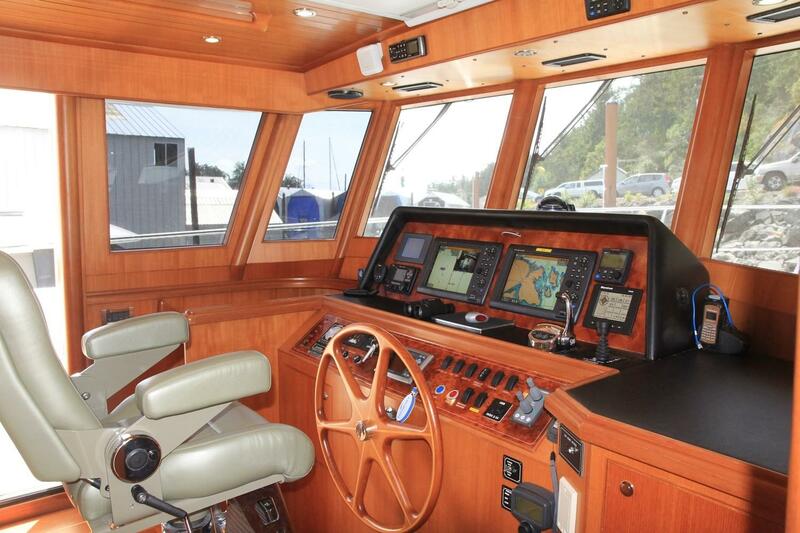 Nautilus is pristine and has an extensive list of factory options, and upgrades. 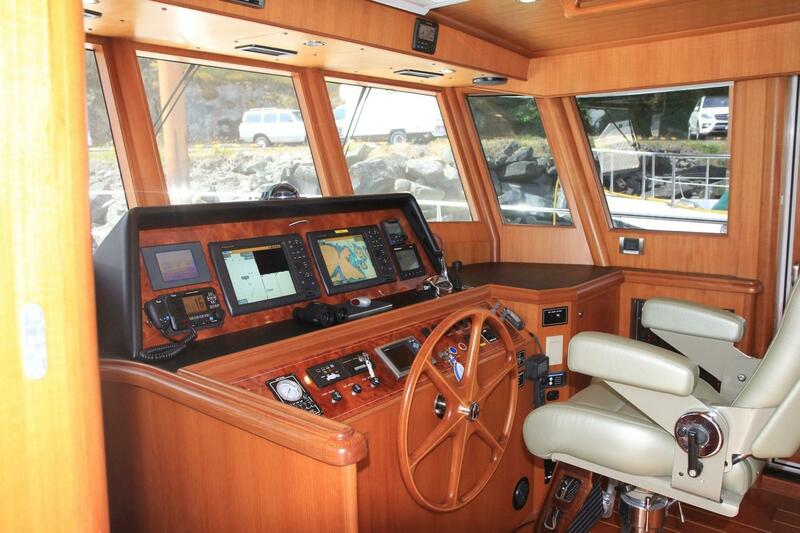 A few features to note: one owner since new, professionally maintained with a strict service regimen, single Cummins 540 common rail (optional factory upgrade), extended boat deck (optional factory upgrade), Keypower stabilizers and get home system, port and starboard cockpit gates (optional factory upgrade), updated Furuno system. 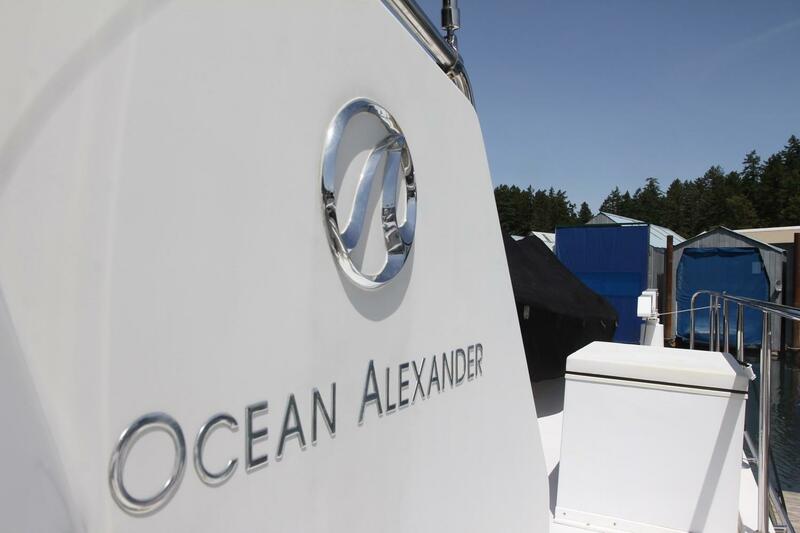 Ocean Alexander has been building boats for more than 35 years, with over 2,000 yachts completed so far. 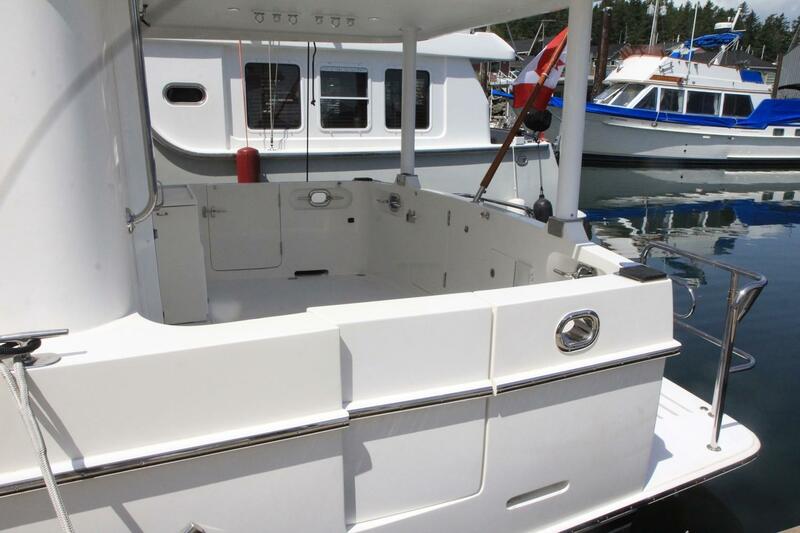 This is a family-owned business with its own yards in Kaohsiung, Taiwan, and Shanghai, China, and is one ofthe larger boatbuilders in the industry. The company was founded by Alex Chueh and is currently managed by his son, John Chueh. 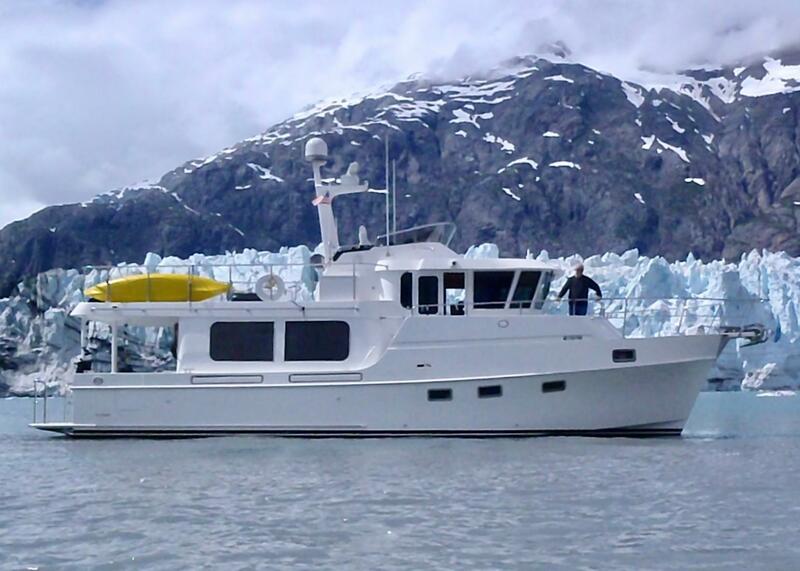 Since 1977 Ocean Alexanders have been designed exclusively by Ed Monk Jr.
Over the years, Ocean Alexander has built trawlers, pilotlhouse yachts, and motoryachts in various sizes and configurations, ranging from 38 feet to over 120 feet. 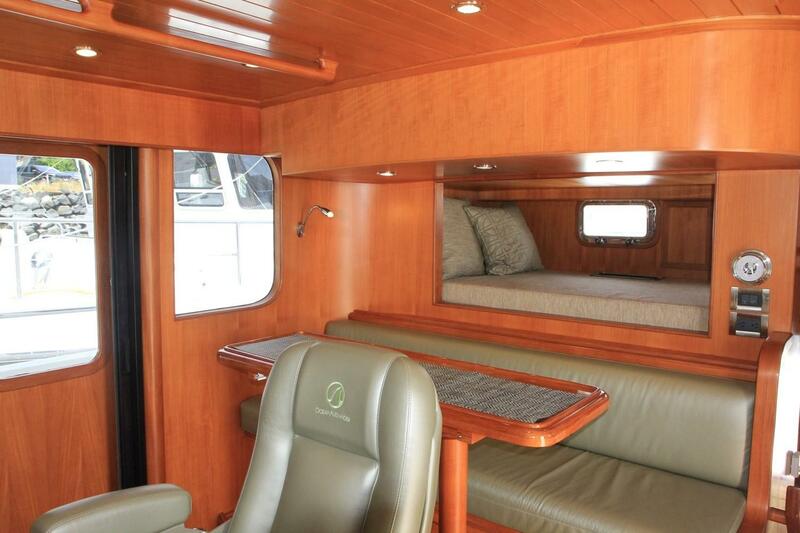 The 50 Classico is an ocean trawler that began life in 2000. Originally introduced as a 43, she was enlarged to a 46 in 2006. 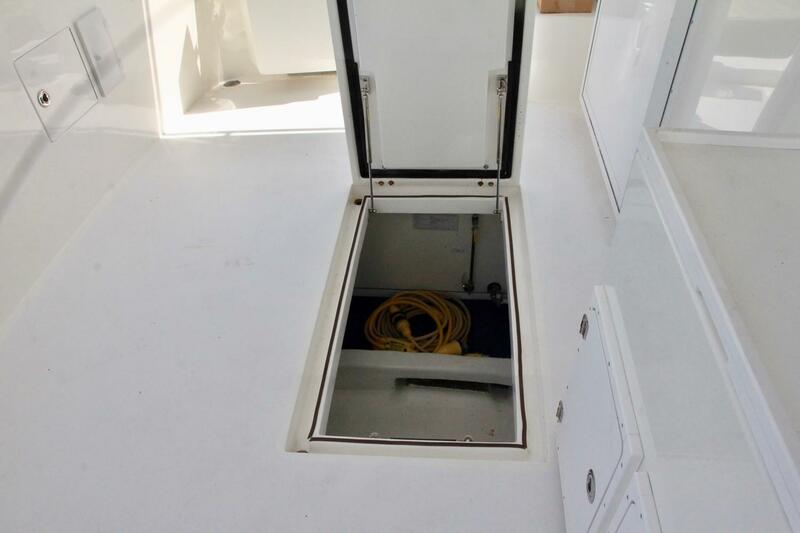 The current model is essentially the same as the 46, but the boat is now designated as a 50, measuring almost exactly 51' from her bow sprit to her swim platform. 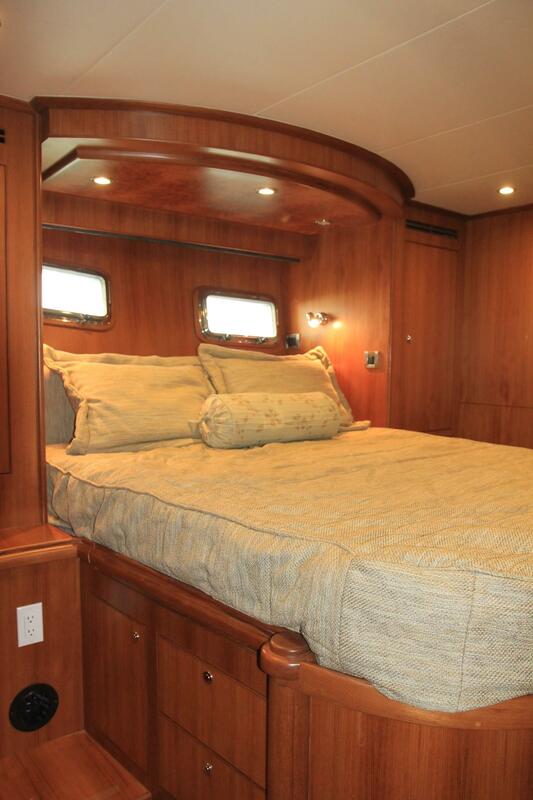 This is hull 14 of the Classico 50, the last one built. She is refined. And will always be the newest OA 50 Classico to be found. 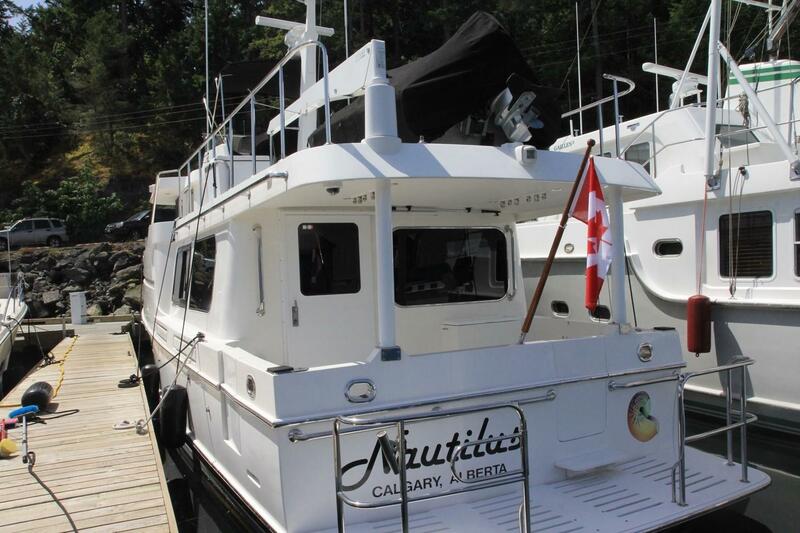 Nautilus is a stout and elegant yacht, designed for safe and comfortable passage making, and her pilothouse design makes her perfectly suited to cruising our BC waters. 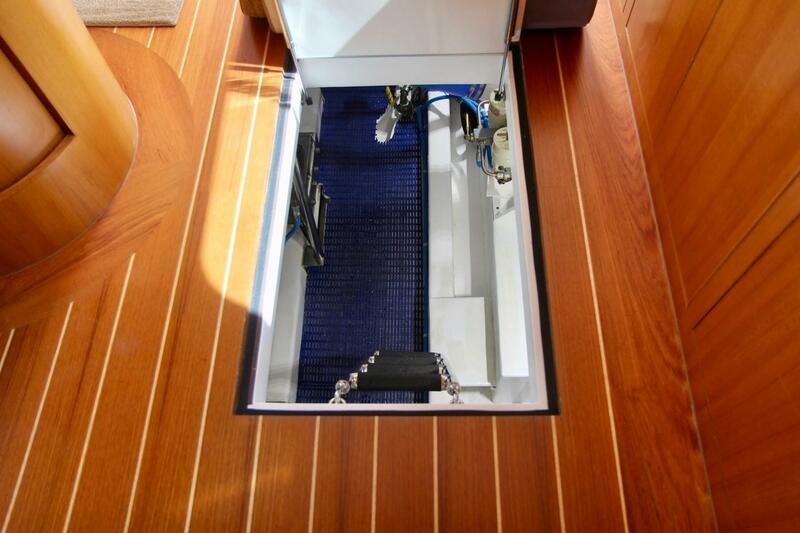 Board Nautilus so easily, accessing the cockpit via opening doors at port, starboard or aft to the swim platform. 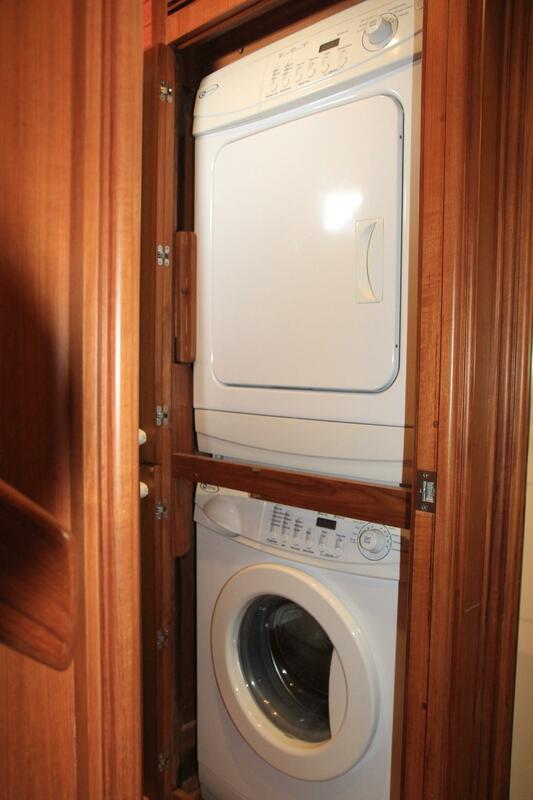 This third door on port was a factory option and eliminates any potential anxiety or need to dock to the same side all the time. Enter the salon through the wide 112cm (44") sliding door, to a space surrounded by large windows, filling the area with natural light and fresh air. 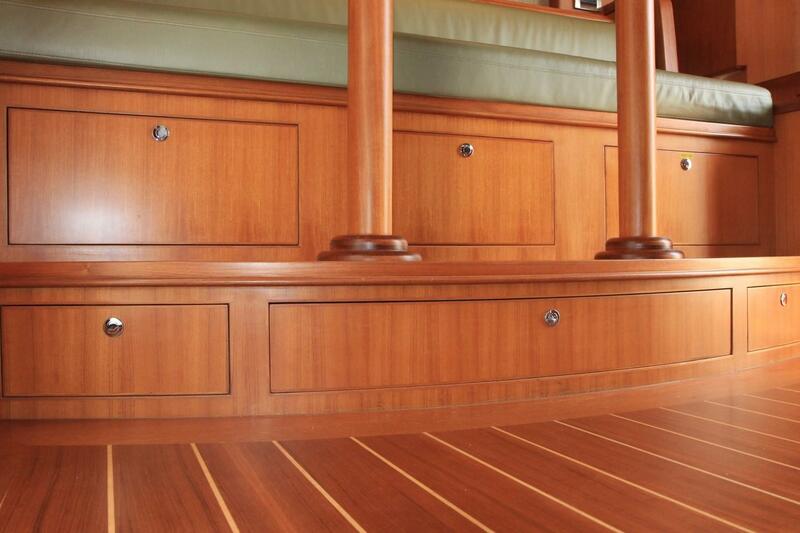 Traditional varnished teak and holly soles, custom carpet runners, teak panels and joinery with a satin finish throughout, soft cream headliners. Understated elegance, in natural tones, inviting your own sense of style. 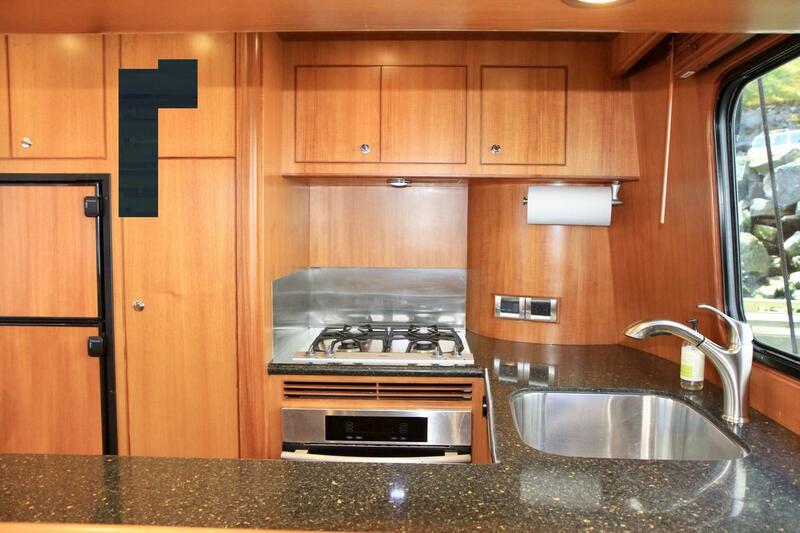 The salon and the galley are on the same level. 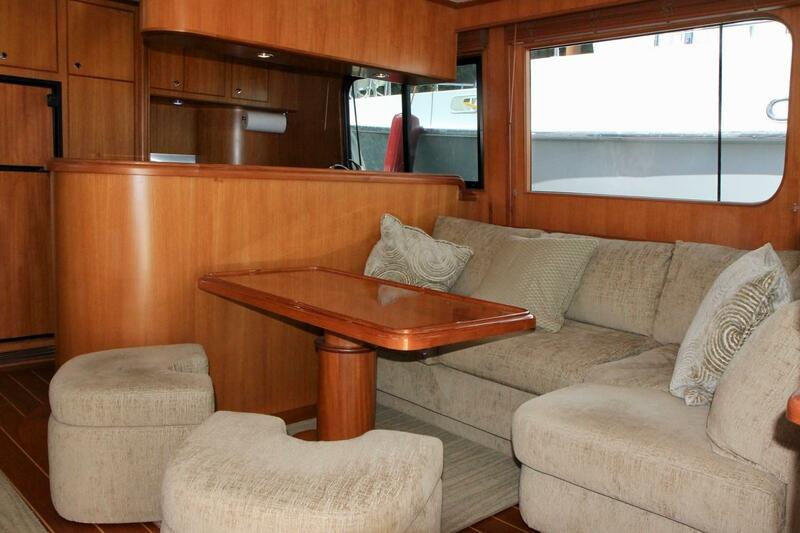 A functional living space that is perfect for entertaining. 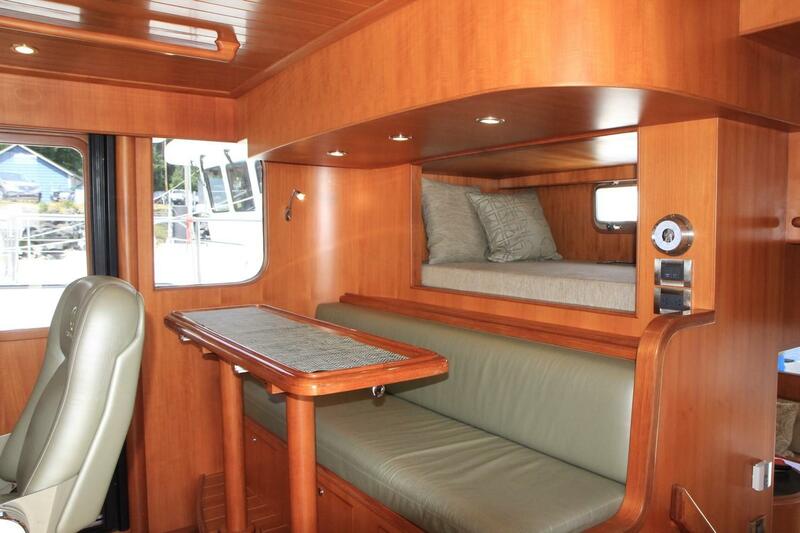 Up four steps to the pilothouse with port and starboard doors, pilot berth, and settee. 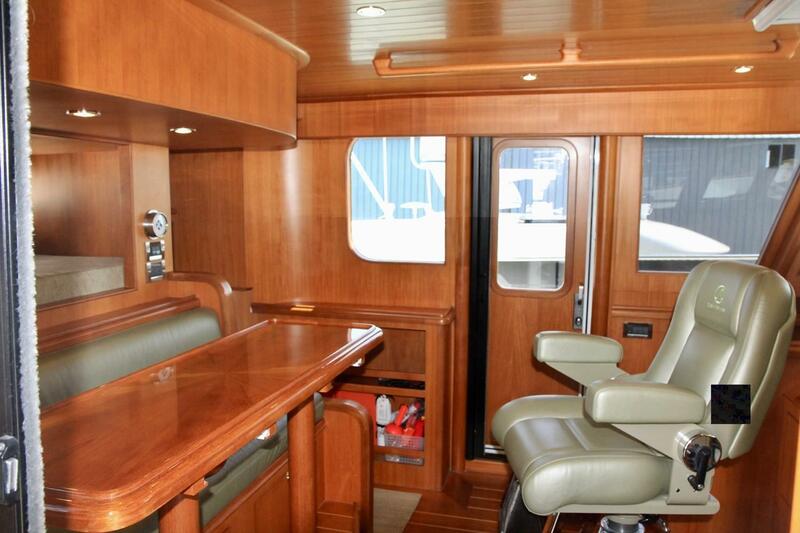 Down stairs from the pilothouse to the accommodations area with two cabins and two heads. 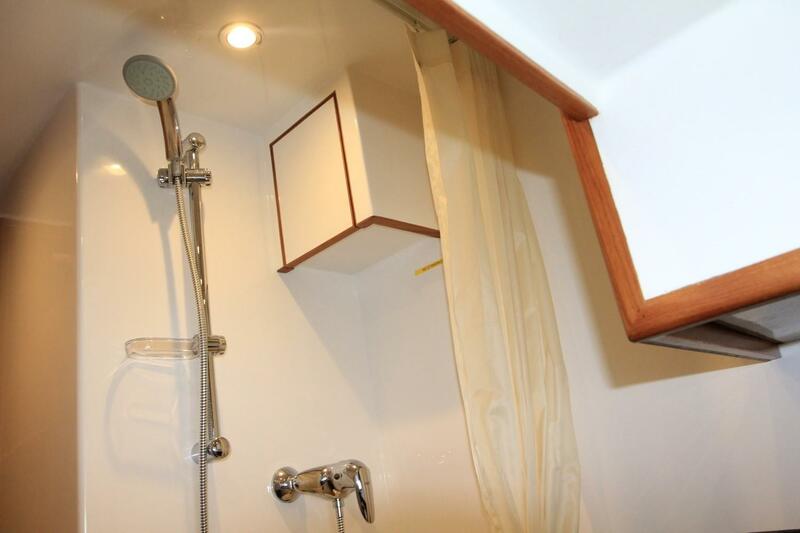 The guest cabin is forward with a guest head and shower, and the master is midships, also with head and shower stall. 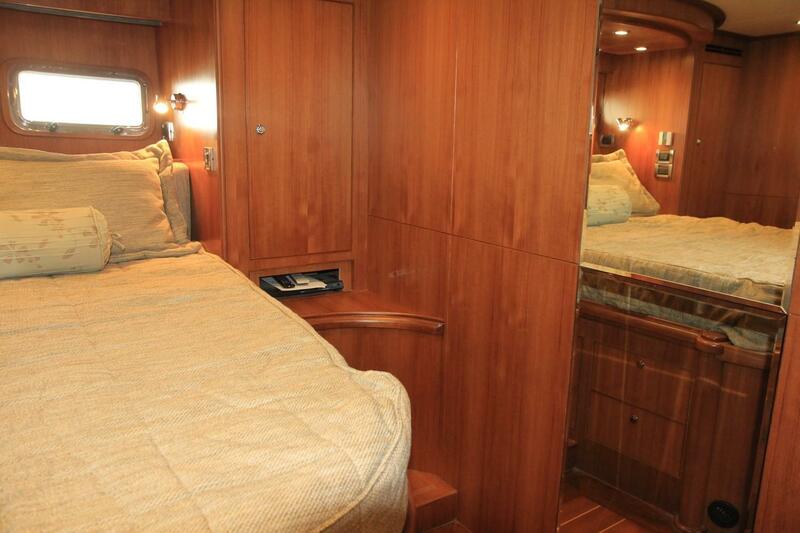 The accommodations area is down the stairs from the pilothouse. 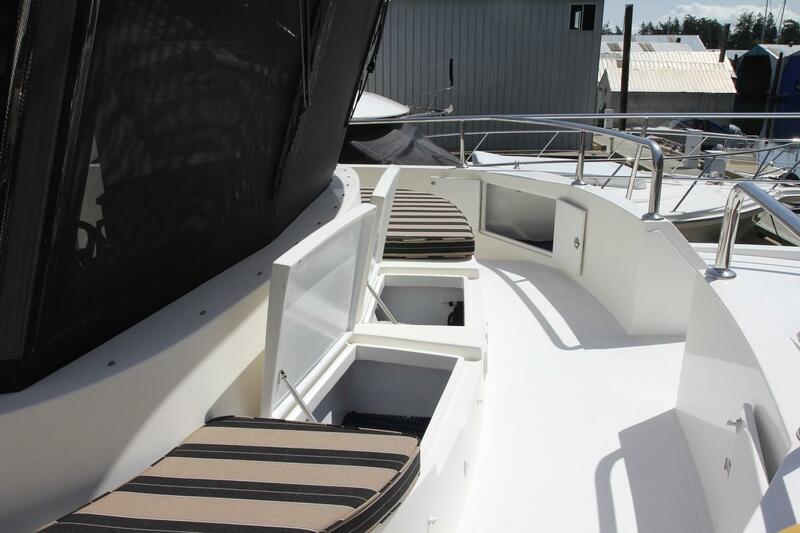 There are seven stairs designed to keep you secure in a sea way in that they are just the right width and with just the right gentle curve allowing the designer to use the spaces wisely. 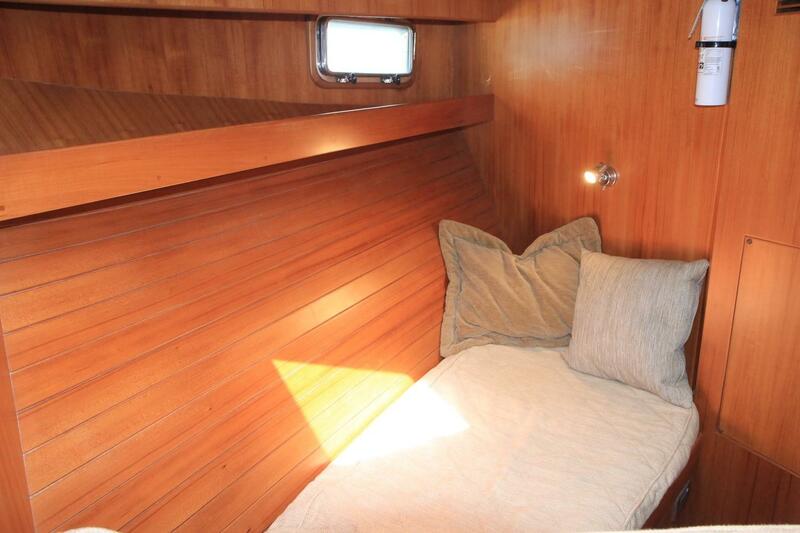 Forward, find the guest cabin with two generous single bunks. 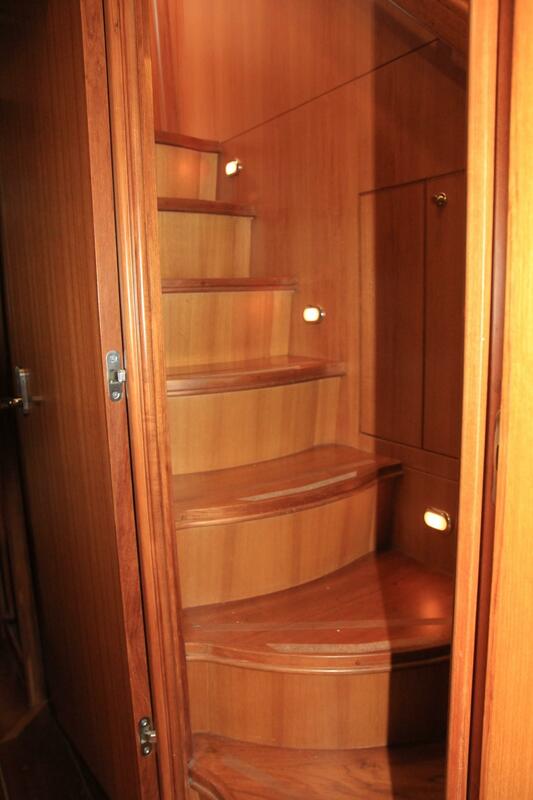 Large shelves, reading lights, and copious storage in numerous cupboards, drawers and a cedar-lined hanging locker. 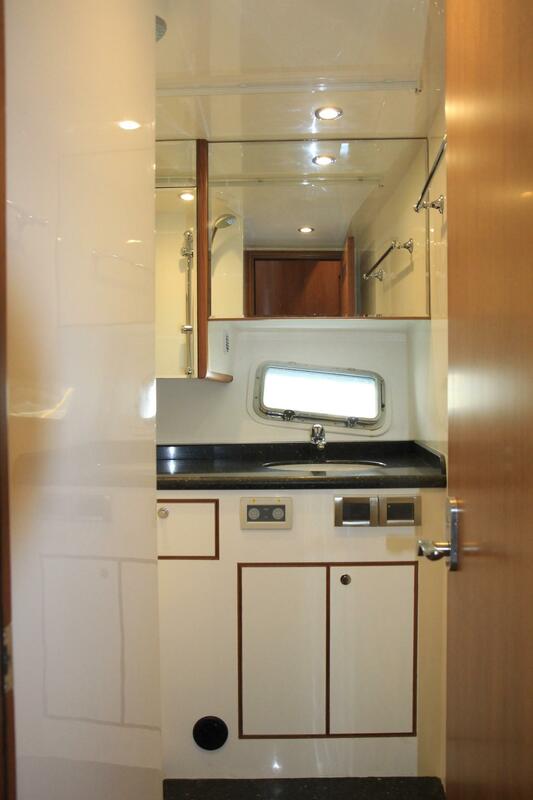 Guest head for day use or for guests in the forward cabin with granite counter top, easy-to-care-for formica surfaces with teak trim, shower. 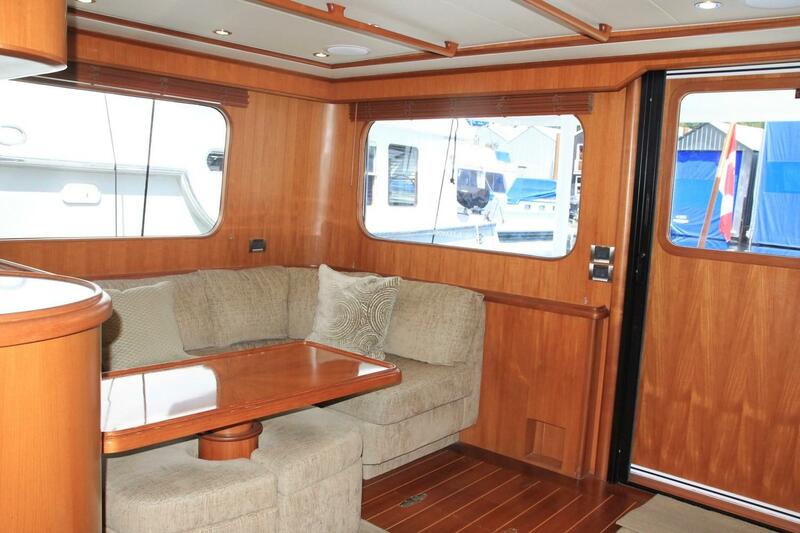 The salon is a warm inviting space with soft plush upholstery on the settee, big soft pillows, cream coloured headliner with teak trim, all set on a background of varnished teak throughout. 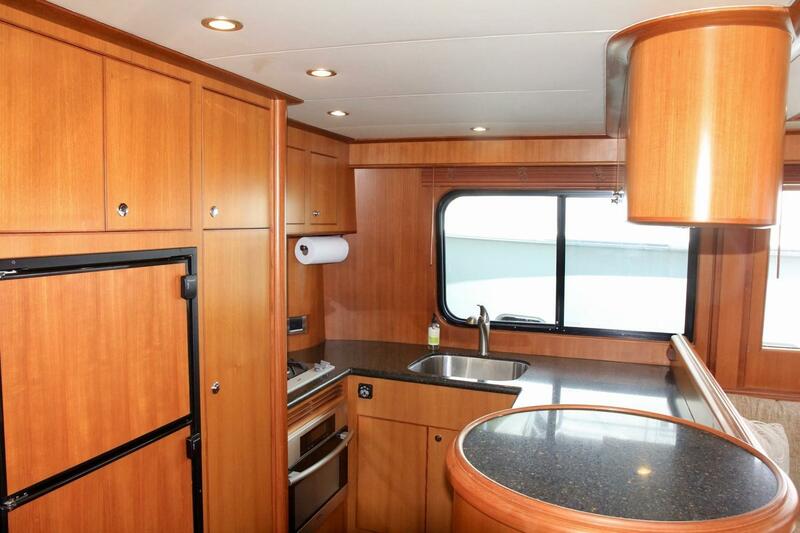 The galley is a good size, with room for two, with generous working surfaces and abundant storage. 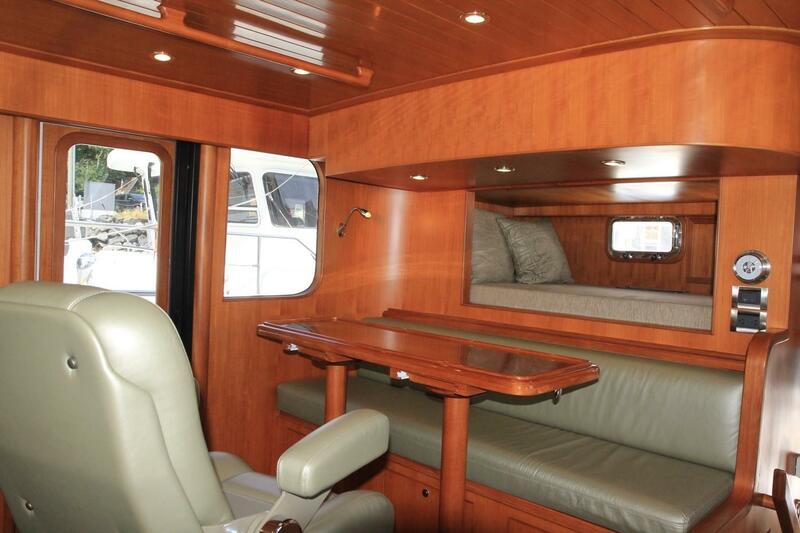 A couple can spend all summer cruising our coast with room on board for all necessary provisions. 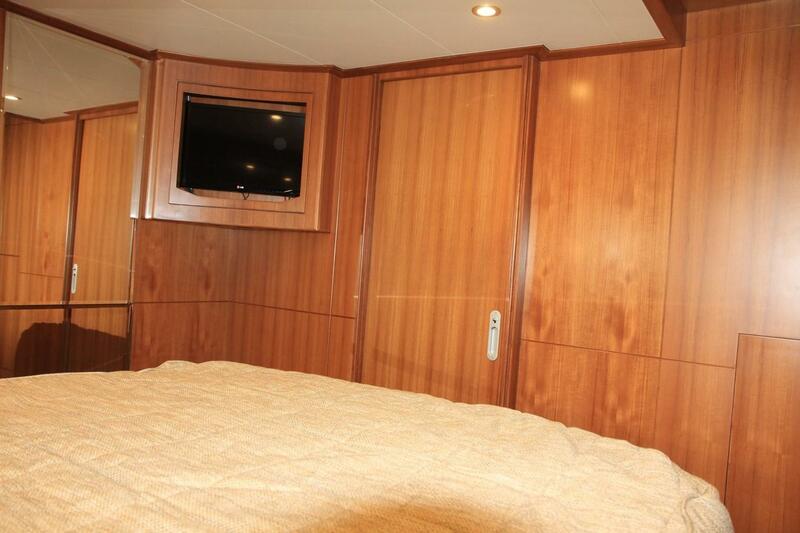 On Nautilus, some might call this the heart of the vessel, with great views and ample room for the guests to join the operator in supreme comfort. 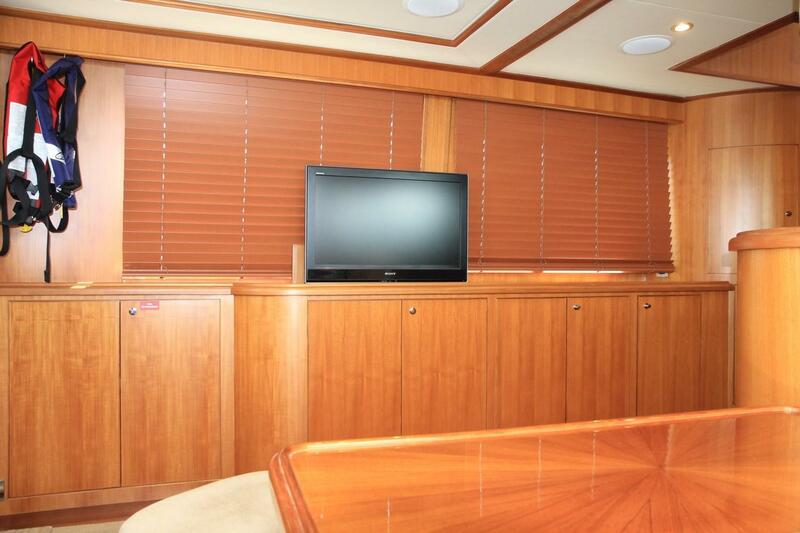 At sea, this is a space where all can command a great view of the seascape. 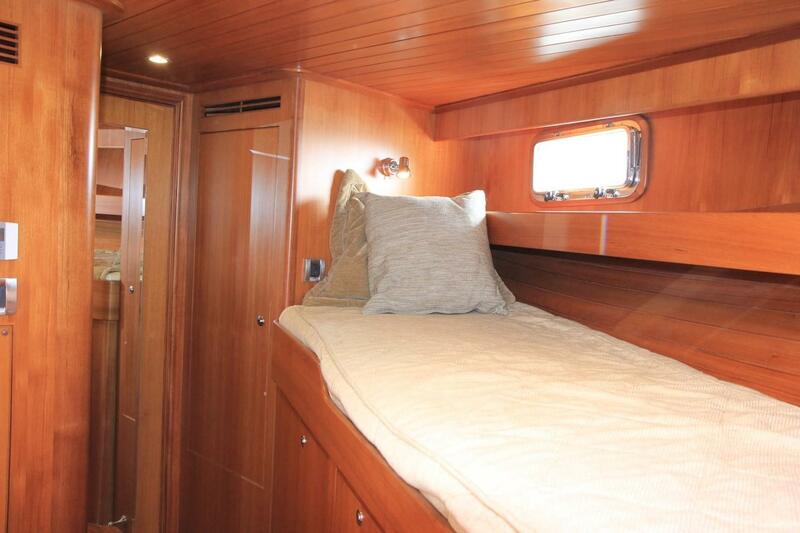 At anchor, a wonderful space for a morning coffee, an evening read, or an afternoon nap! 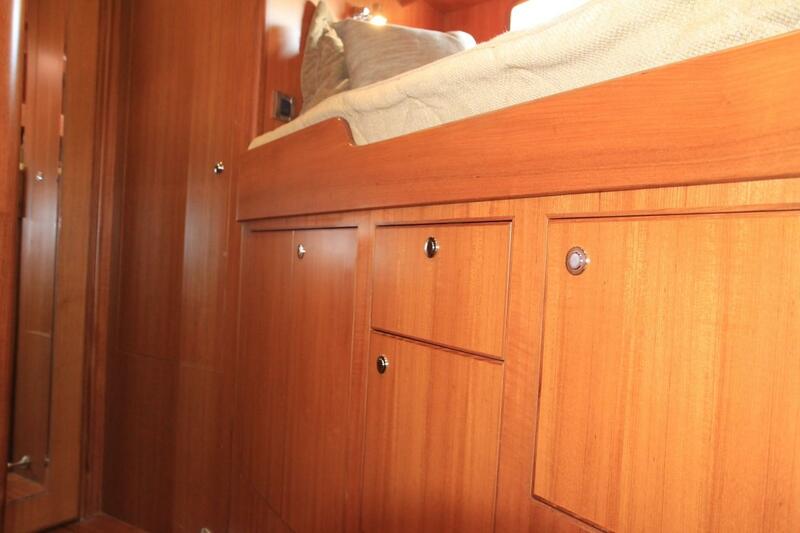 The flybridge is access from the portside pilothouse door up lighted stairs. 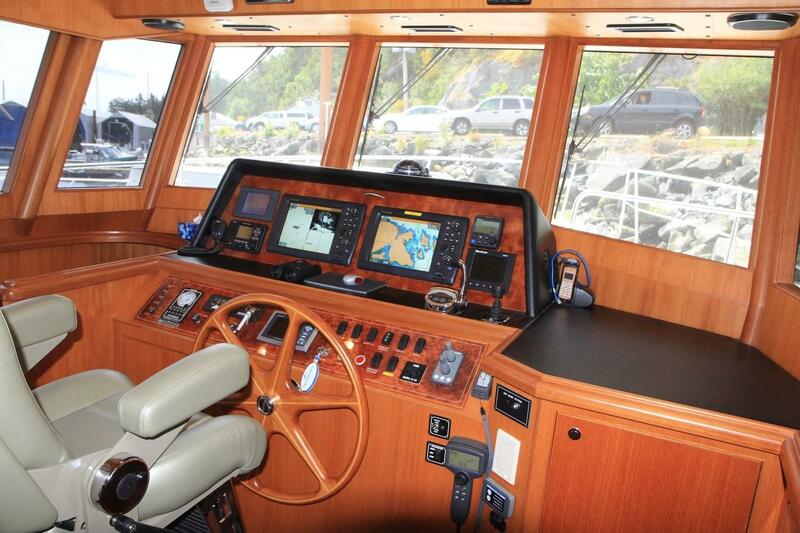 The operator's Stidd chair and controls are on the centreline with settees on both port and starboard. 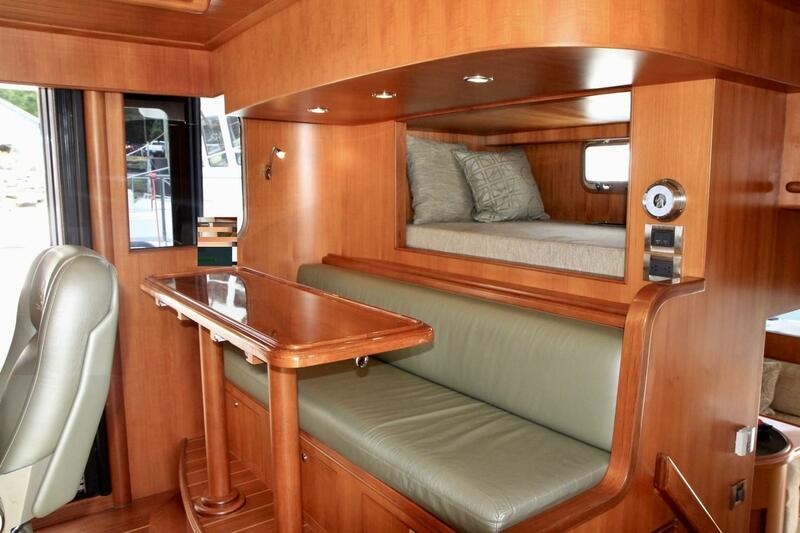 Aft of the flybridge, the boat deck is huge. 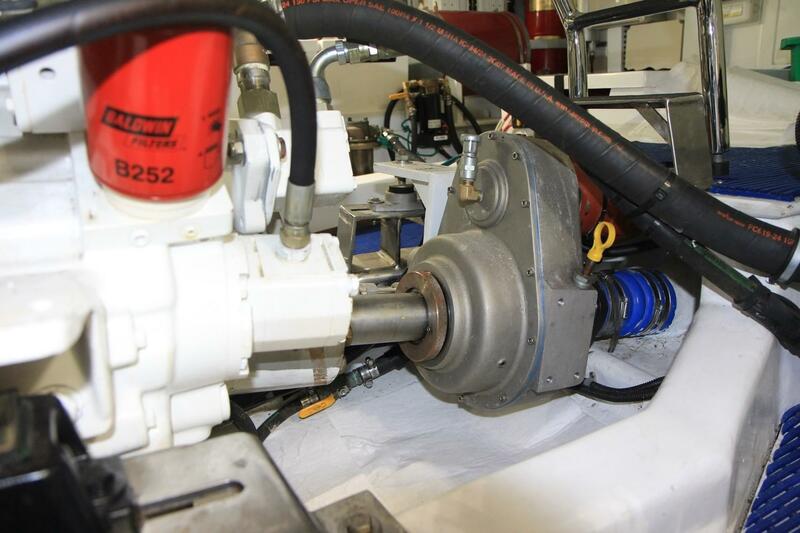 Extending it was another costly factory upgrade. It completely covers the cockpit below. 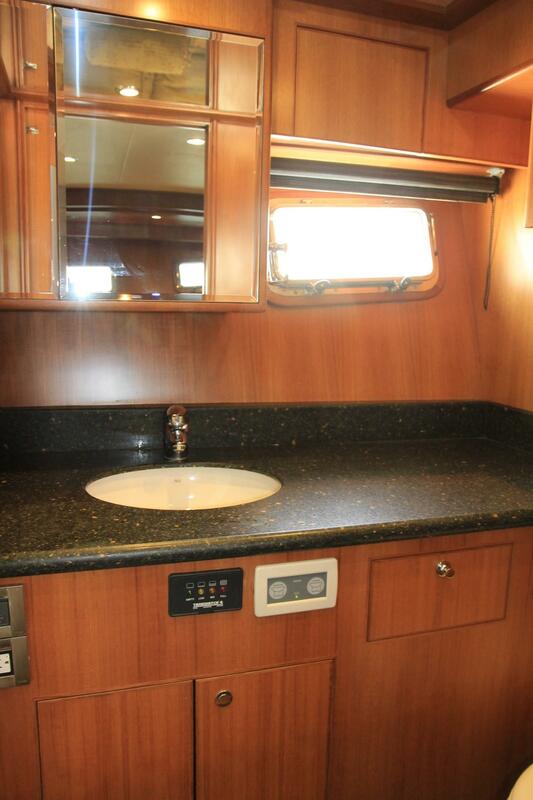 And there is plenty of room for the tender and whatever cruising toys you care to carry! 12VDC deep freeze for extra provisions, or for stowing the bounty! 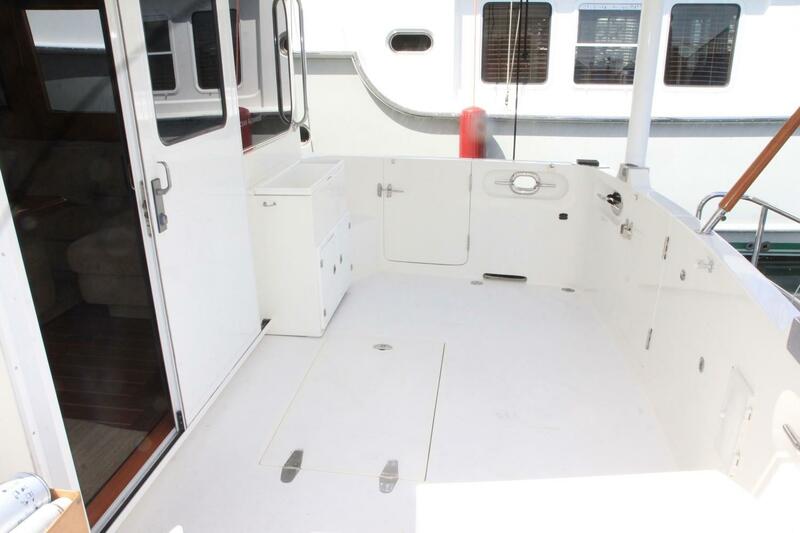 The cockpit is 3.6m x 2m (12' x 6' 6") and is great for fishing, or for lounging and dining al fresco. 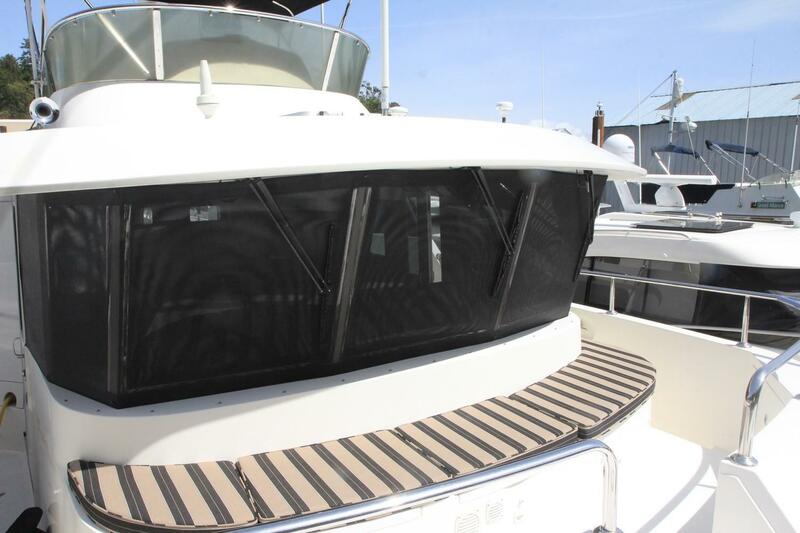 It is protected from the sun and elements with the overhanging boat deck above, extended aft to the end of the cockpit. 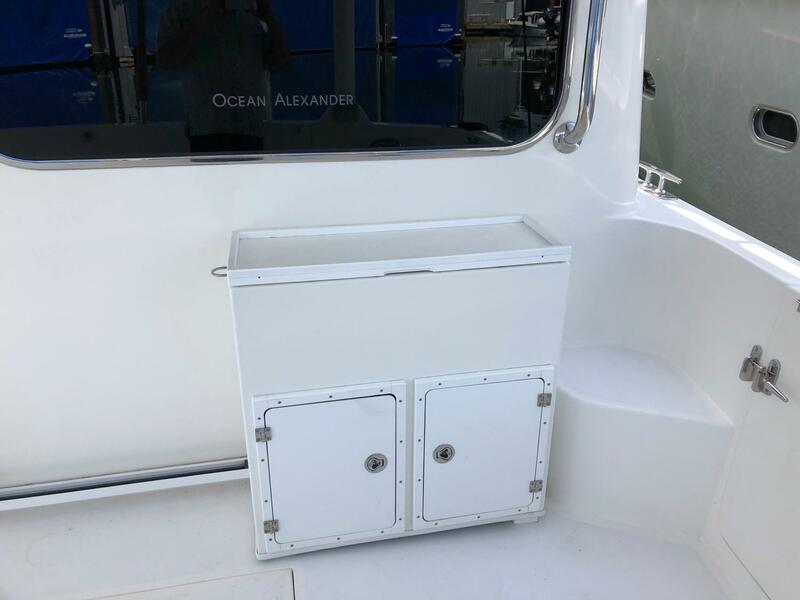 Because the boat deck above may interfere with fishing, fixed staples were added to the 96cm (38") swim platform, as a more suitable and safe place to fight and land your catch. 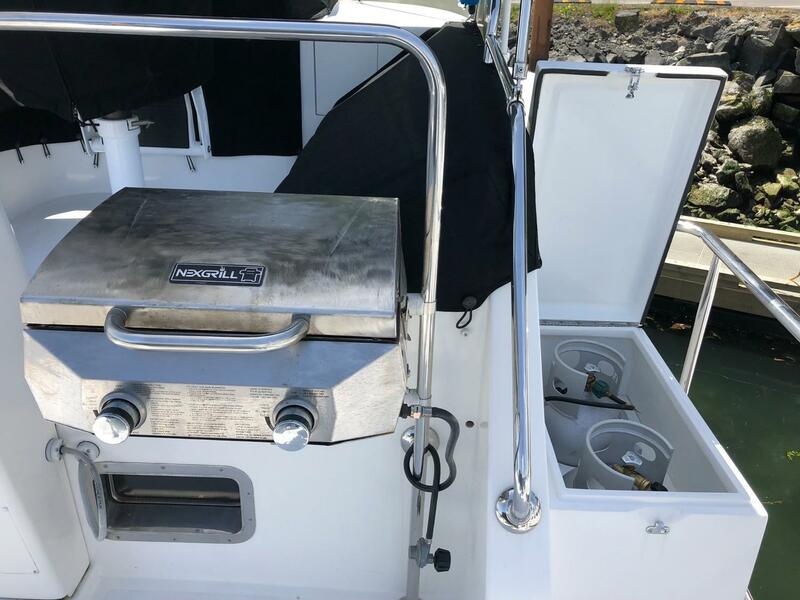 There is also a simple but ingenious stainless steel grab bar that swings out from the staple to assist getting in and out of your kayaks, making the task safer and more comfortable. 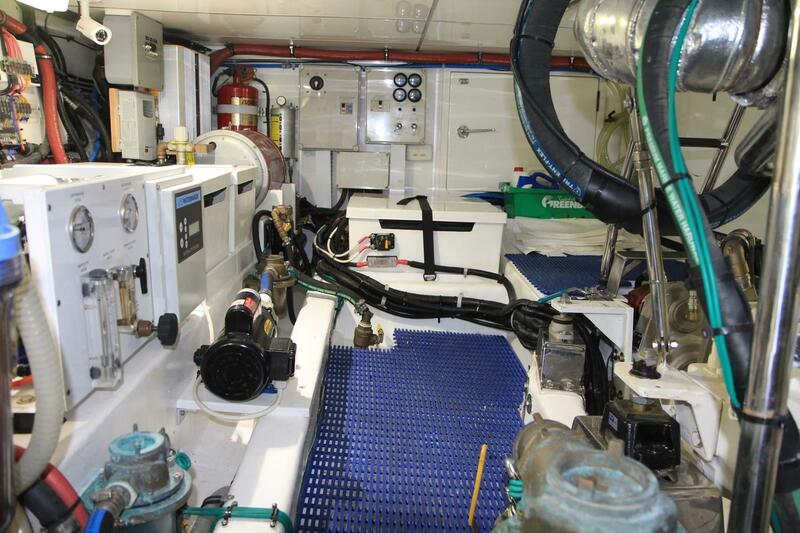 Owners and guests can rely on the AC and DC power systems, servicing the vessel through circuit breaker panels with appropriate voltage and ampere gauges. 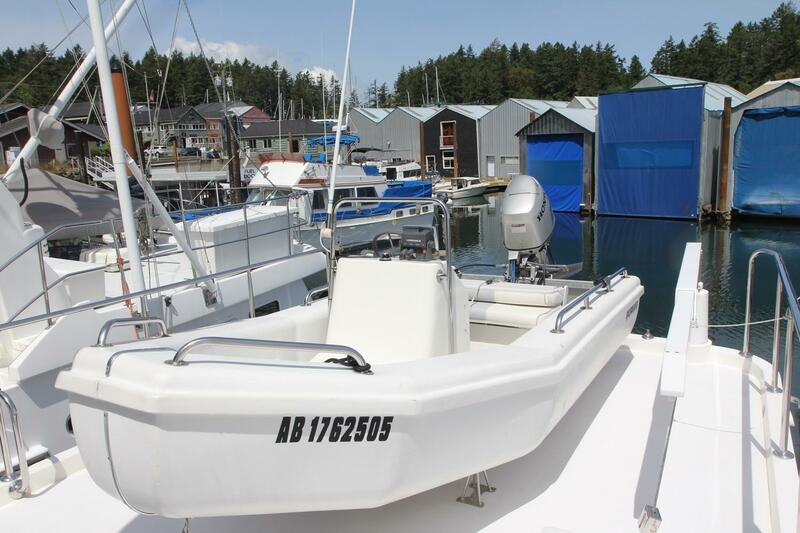 110VAC is provided by 50 Amp shore connection (bow or stern), by the 12 kW Northern Lights generator, and, based on the available house bank battery power, through the inverters. 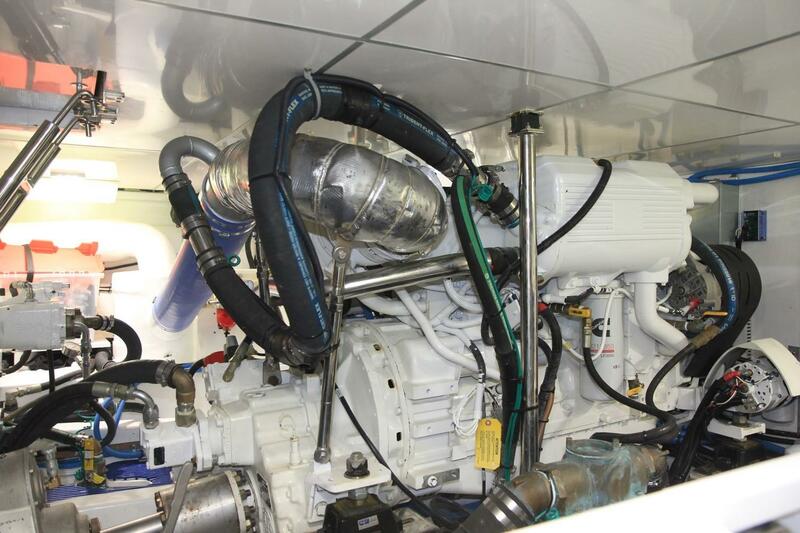 At sea, the batteries are charged by engine or generator driven alternators and while at a dock, by the inverters and chargers via shorepower. 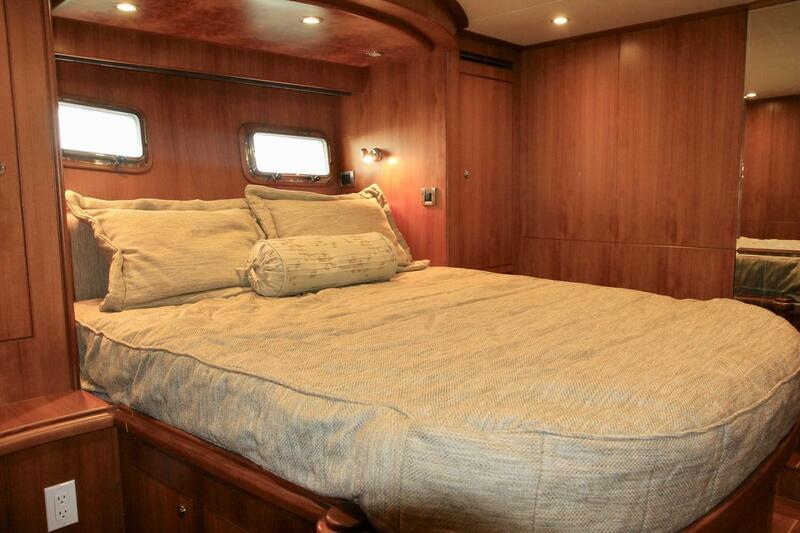 As expected, the engine room is spectacular. 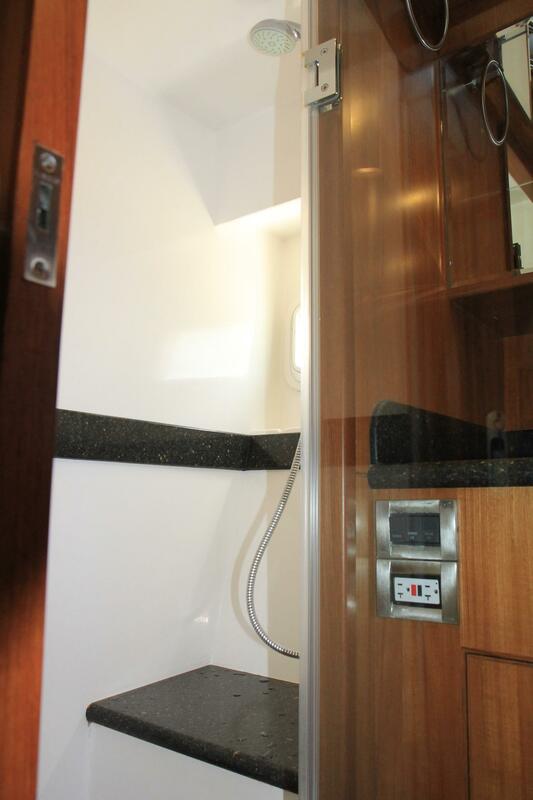 It is a properly engineered space with easy access all around, superb light. 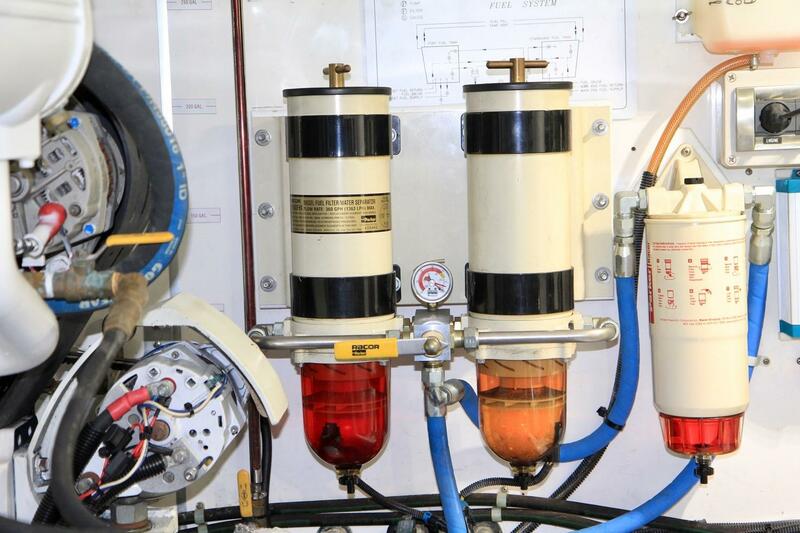 The systems are well organized out and professionally installed. 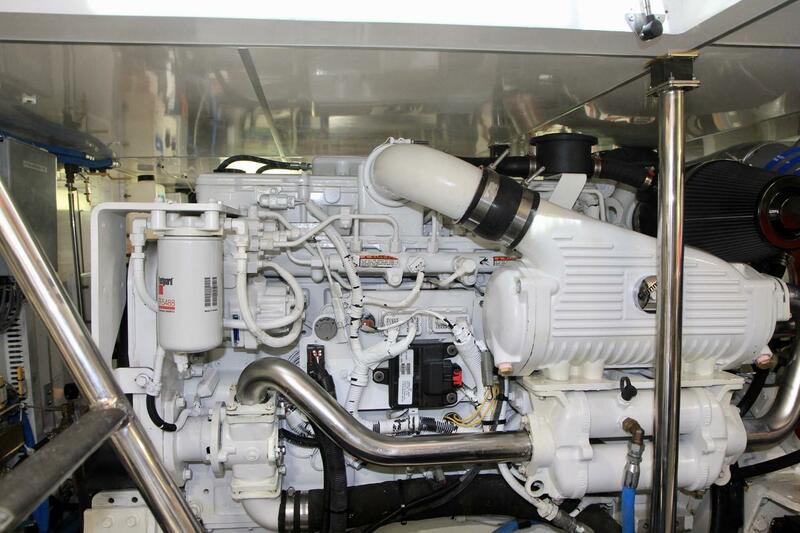 There are options and upgrades throughout starting with the main engine - a 540 horsepower Cummins engine. A 300hp John Deere would have been standard. 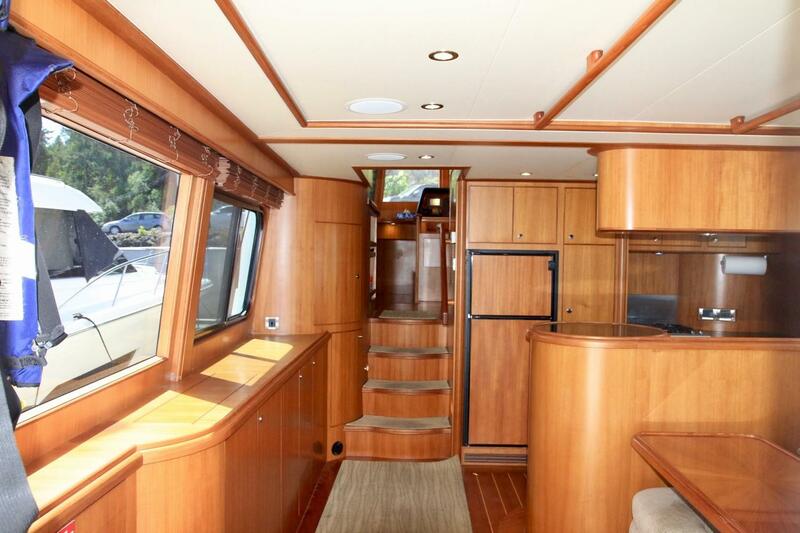 Hi there, I would like more information about the Ocean Alexander 50 Classico LRC.